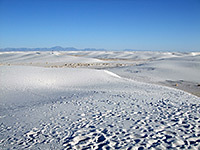 Apart from a restricted zone adjoining the missile range to the west, well away from the access road, all areas of White Sands National Monument are open for hiking, but the lack of any landmarks in the middle of the dunes, and the unchanging scenery, make long cross-country trips not very common. Most people just walk along the three short paths close to the scenic drive (Playa, Dune Life and Interdune Boardwalk), though there is one longer trail, a 4.6 mile loop that starts from the far end of the road and heads northwest across the dunes to the far edge, where the sands are replaced by a vast, featureless dry lake bed - the Alkali Flat, a remnant of ancient Lake Otero. The unique aspect of the path is the line of small posts, which (apart from footprints) is the only indication of the route, as any established trail would quickly be obscured by blowing sand; the hike is across completely white terrain lacking any other navigational aid apart from distant mountain ranges on the west and east horizons. 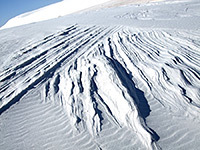 The blue and white landscape is of course intensely hot in summer, and the surface of the sand is quite soft so the loop takes rather longer then might be expected, from 2 to 3 hours. Map of White Sands National Monument. 9 views along the Alkali Flat Trail. Alkali Flat; full screen version (10 mb). The dunes; full screen version (9 mb). The trailhead and register are beside one of the wide cleared areas along the loop part of the Dunes Drive, from where the path sets off across firm ground between the dunes then climbs into the pure white mounds and remains on soft sand most of the way, with a few short, steep climbs and descents between long, fairly level stretches. The route is straight, heading northwest towards the far away San Andres Mountains, over land almost totally without any vegetation, apart from the occasional sumac bush, soaptree yucca or clump of grass, sitting on a pedestal of hard, compacted sand. The marker posts are about 300 feet apart, topped by reflective orange tape, and are quite easy to follow though some have been buried by sand leaving just a few inches exposed. After a mile or so during which the foreground views are similar in all directions, the far edge of the dune field becomes visible, bordering part of the 20 mile wide alkali flat, at this point quite empty apart from a few buildings and towers from the White Sands Missile Base. The final dune is reached after 2 miles (distances are indicated by signs every half mile), then the path continues 0.2 miles further to a viewpoint, from where the markers head off northeast, over the flats and back into the dunes; the return leg is roughly parallel to the outward part but about half a mile from it, far enough away to be out of sight. Ahead, the mountains on the horizon are now the larger Sacramento range, some sufficiently high to be topped by snow well into summer. 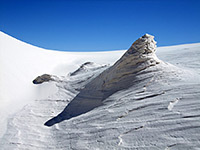 Apart from the dunes and the scarce vegetation, the only other features en route are thin, curving ridges on the interdune flats, and a few stone sculptures where gypsum has been solidified then partly eroded, creating strange, layered formations.